Wanting to eat something else other than rice or oatmeal, I decided to buy Heavenly Choco Cake Slice and Heavenly Marble Cake Slice from Goldilocks. So heavenly! These two taste good. But next time I won’t eat like this again because I got hungry after hours. It didn’t make me full. In our afternoon break at around 3pm, I bought B2 meal from Jollibee which consisted of Cheeseburger, fries and coke zero. Not a healthful snack but heavy for tummy. I got satisfied by this. My breakfast and snacks for the day. 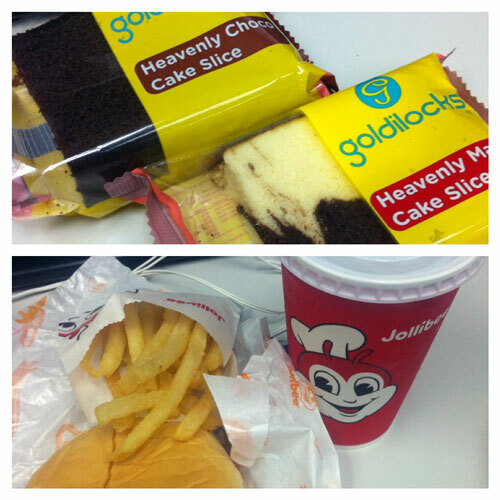 This entry was posted in Daily Me, Food Corner and tagged burger, cake, food, fries, goldilocks, jollibee. Bookmark the permalink.